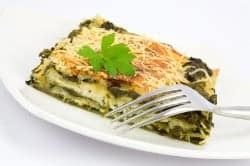 Olive Garden Florentine Lasagna is a spinach and mushroom based lasagna. You can either do this one with a marina or even an Alfredo sauce. If you are looking for a meatless meal this makes a hearty meal and is likely to please even the meat lovers. Steam spinach until tender; press out excess moisture and chop coarsely. Cook mushrooms, onions and minced garlic over medium-high heat until onions are tender; drain excess liquid and cool. Mix ricotta cheese, 2/3 cup Parmesan, egg, salt, pepper, basil and oregano in large bowl. Add cooled spinach and mushroom-onion mixture and mix on low speed until just blended. Cook lasagna according to package directions; rinse under cool water and drain thoroughly. Place four lasagna strips in bottom of lightly oiled 9 by 13 inch pan, overlapping slightly. Top with 2 cups of spinach filling. I have made roasted vegetable lasagna but never florentine this was so good!